An arguement over a penny doesn't seem worthy of calling police in, but for Lincoln penny collectors, things got a little heated Thursday. Lincoln's birthday was Feb. 12, but the bicentennial of his birth is being celebrated all year. The yearlong celebration by the U.S. Mint continued with the release of the third of four new pennies, causing a shouting match among collectors outside the Old State Capitol in Illinois, which is depicted on the back of the coin. While the crowd lining up for the new pennies was mostly subdued, Springfield police intervened when two groups of visitors argued over who was cursing or cutting in line, according to the State Journal-Register in Springfield, Il. The back of the penny released Thursday shows Lincoln delivering a speech outside Illinois' Old State Capitol, where he served as a legislator, delivered a speech on slavery and ran his transition office after being elected president. 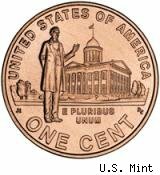 The earlier pennies showed the Kentucky log cabin where Lincoln was born, and a scene of him reading as he took a break from splitting rails in Indiana. The fourth penny will be released in November and celebrates his time as president. The Mint plans to produce 319 million of the Illinois capitol building coins. 1.3 billion of the first two Lincoln coins have been produced. The new pennies follow the Mint's successful programs to increase public interest in coins by issuing quarters comemmorating each state and dollars honoring the presidents. But aside from the collection frenzy the Mint hopes to create, pennies are a poor type of currency. It costs 1.4 cents to produce a penny, according to the Associated Press. Some ideas for turning worthless, or nearly worthless, pennies into something useful include tiling the floor and making artwork. If you're going to pinch them, you might as well do something with them.